The Spring 2019 Clark School Commencement ceremony will be held Thursday, May 23, 2019 at Xfinity Center. Grad Fair - March 5th - March 7th, 10:00 a.m.–6:00 p.m.
Tickets are required for the campus-wide commencement ceremony. Each graduate will receive four (4) guest tickets, and one (1) processional ticket for personal use. Graduates may claim tickets through their online athletic ticket account. Each graduate who has been cleared will receive an email from the athletic ticket ofﬁce with a notiﬁcation that the printable tickets are available for download on their UMTerps account. Update your address and email address on Testudo, to ensure delivery of your tickets to your email account. Tickets will be distributed electronically to the email address provided in Testudo early May of the respective graduation year. Winter Campus-Wide Commencement Ceremony: Tickets are NOT required. No tickets are required for graduates or guests to attend the Engineering Commencement Ceremony for Spring or Winter. The Engineering Commencement ceremony will be live streamed. Spring 2019 graduates and their families are invited to attend the A. James Clark School of Engineering Graduation Reception on May 23, 2019, from 10:30am-12:00pm at Jeong H. Kim Building Rotunda and Plaza. Please RSVP by April 1st 2019, to participate in the graduation reception and the engineering commencement ceremony. It is important that all graduates arrive on time. Security measures, such as wanding or bag checks, may be in place for entrance into XFINITY. Backpacks and bags larger than 8x11x12 are prohibited. It is important to remember that participating in the commencement ceremony does not imply that degree requirements have been satisfied for graduation. Undergraduate students completing all degree requirements in the summer or Spring 2019 semesters are eligible to participate in the Clark School graduation ceremony. Please RSVP by April 1st, 2019, to participate in the graduation reception and the engineering commencement ceremony. If your degree requirements will not be complete at the end of the semester but you would like to participate in the ceremony, complete a Request to Participate in Engineering Commencement Ceremony form in the month prior to commencement. A complete timeline regarding the undergraduate graduation process and required paperwork is available at Undergraduate Advising and Academic Support Graduation. Graduates are responsible for obtaining their own graduation regalia. Caps, gowns, and diploma frames are available for purchase at the University Book Center located in the Stamp Student Union. You can also purchase all commencement-related materials during the Grad Fair, hosted by the University Book Center on March 5th - March 7th, between 10am-6pm. Students can purchase regalia online starting March 8th. If you live out of state or cannot come to campus to order your regalia, it will be shipped to you at an additional fee. Contact contact Deddison Won dwon1@umd.edu at the University Book Center or call 301-405-9478 for more information. To receive the correct regalia, tell the University Book Center that you have earned a Bachelor of Science degree. Active duty U.S. military personnel are allowed to wear their dress uniform instead of regalia if they prefer. Latin honors at the time of commencement are tentative. The final determination will be made when all grades are submitted for all semesters. To view GPA cutoffs and review the university policy, visit the Office of the Registrar website. For information on department honors, please contact your department. Arrive one hour before ceremony to lineup for processional on May 23rd. Upon entering the Pavilion (room 0601) at the XFINITY Center, look for the name of your department to pick up your name card. You will be asked to give this card to the Reader of Names during the ceremony. Be sure to complete the survey on the back of the card. Clark School staff will be on-site to assist you in preparing for the processional. Diplomas will be mailed to those who have completed all graduation requirements approximately six weeks after graduation. Information regarding graduation procedures are available on the Graduate School page. Inquiries regarding commencement ceremony participation should be directed to your departmental graduate advisor. Please RSVP by April 1st 2019, to participate in the graduation reception and the engineering commencement ceremony. To receive the correct regalia, be sure you provide University Book Center staff with the name of the degree you are earning: Master of Science (gold hood), Master of Professional Studies in Technology Entreprenuership (gold hood), or Master of Engineering (orange hood). If you do not know, talk to your departmental graduate coordinator. Arrive one hour before ceremony to lineup for processional on May 23rd. Upon entering the Pavilion (room 0601) at the XFINITY Center, look for the sign with the name of your degree, e.g., MS, MEng, MPS, to pick up your name card. You will be asked to give this card to the Reader of Names during the ceremony. Be sure to complete the survey on the back of the card. To receive the correct regalia, tell the University Book Store staff that you have earned a doctoral degree. Be sure to make prior arrangements with your advisor to be hooded during the Clark School ceremony. If your advisor is not available, you can ask another member of your committee or a favorite faculty member to hood you, or your department chair can hood you. Inquiries regarding commencement ceremony participation should be directed to your department. Arrive one hours before ceremony to lineup for processional on May 23rd. Upon entering the Pavilion (room 0601) at the XFINITY Center, look for the Ph.D candidate sign to pick up your name card. You will be asked to give this card to the Reader of Names during the ceremony. Be sure to complete the survey on the back of the card. Diplomas can be picked up after commencement in the Diploma Office, located on the first floor of the Mitchell Building. The Diploma Office will not be open the day of commencement but will open for regular office hours the following business day. Family and friends should arrive no sooner than 60 minutes prior to the start of the processionals as there are other graduation ceremonies scheduled in XFINITY Center prior to the Clark School’s ceremonies. Tickets are not required and plenty of seating is available. The university does not issue invitation letters for guests to visit the U.S. to attend commencement ceremonies. These letters are not required by the embassy to issue a B2 visa, which is designated for tourist activities such as sightseeing, visiting friends and relatives, and obtaining medical treatment. The graduating student should submit a copy of their I-20 or DS-2019 to the relative applying for the tourist visa. You can also send an Enrollment Verification Certificate along with the copy of your passport. GradImages, the university’s official photographer, will take photographs of each graduate participating in the campus-wide commencement ceremony prior to the procession and one at the Clark School graduation ceremony as they cross the platform. While there is no obligation to purchase the prints, the graduate will receive color proofs email approximately two weeks after commencement. In order to receive the proofs, be sure to complete the company’s address card distributed in the line-up area prior to the procession. The XFINITY Center is designed with parking, restrooms, water fountains, ATMs, and seating areas accessible to guests with disabilities. Power-assisted doors and closed captioning are also provided. Parking in all surface and pay lots is free and available first come, first serve on commencement days. Parking for guests with disabilities is available at the XFINITY Center in Lot 4B and in the Terrapin Trail Garage. No special permit is required for the Clark School ceremony. The University of Maryland does not have wheelchairs available. If you have difficulty walking long distances, consider renting a wheelchair from an off-campus vendor. If you require accessible transportation for a disabled guest the day of commencement, please make arrangements by calling dispatch services at 301-314-0318. There is designated seating for elderly or disabled guests who cannot climb stairs on the Concourse level (level 3) above sections 120 and 121. Due to limited space, the university recommends that only the person with the disability and one other guest sit in the accessible seating. Additional members of your party should sit in regular seating areas. You do not need to reserve seating for special needs guests. All Clark School ceremonies are closed captioned. Students or guests requiring sign language interpretation should send an email to engr-commencement@umd.edu by April 15, 2019. Top of Sections 105 and 110 on the Plaza Level (Level 2). Behind Sections 122 and 217 on the Concourse Level (Level 3). Visit the university commencement site for more information on the campus-wide ceremony. 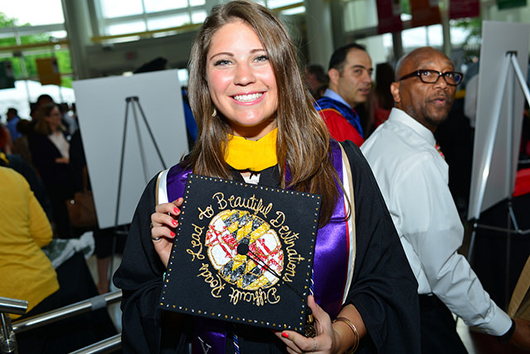 For questions related to the Clark School ceremonies, send an email to engr-commencement@umd.edu.